INDIANAPOLIS--Replacing Gov. Eric Holcomb has become a priority for medical cannabis reform advocates, who say the governor has ignored something they believe will improve Hoosier quality of life. David Phipps. who has been lobbying for cannabis reform, said he will support whatever candidate supports medical cannabis. 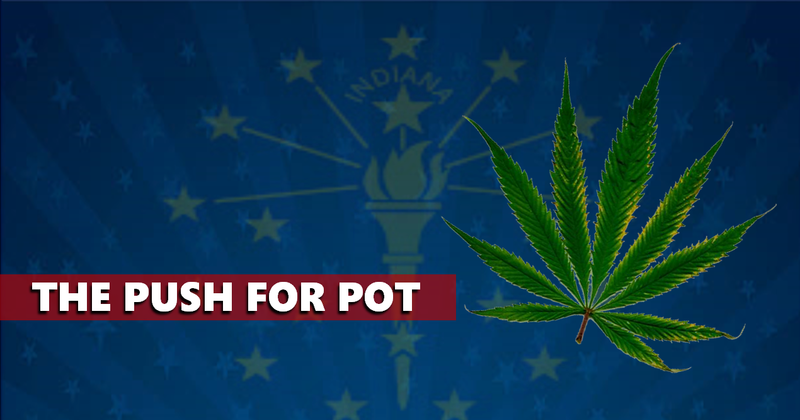 Holcomb has said he believes marijuana is a gateway drug, and that he will look at the issue if it becomes legally federally, if it is rescheduled. "If we did anything this past year, it was prove majority support on this issuer to our governor and he showed us that he just doesn't care if majority support is there or not," said Phipps. Holcomb did not mention the issue in his State of the State address. Phipps said he believes Holcomb effectively killed the issue for this year's legislative session by scaring off the committee chairs, so that the issue will not get a hearing, much less make it to the floor for a vote. So, advocates are changing their strategy. "There are thousands of Hoosiers in all 92 counties, ready and willing to volunteer for whatever gubernatorial candidate comes forward in support of this issue," said Phipps, adding that he believes it can be the central part of someone's platform, be it Democrat, Republican or Libertarian. Phipps said he could see himself getting behind longtime supporter Sen. Karen Tallian, or Rep. Jim Lucas, a Republican who has been supportive of medical cannabis. Phipps said he believes many Republicans would openly support the issue, were they not scared off by Holcomb. "If he is challenged in the Republican primary...it will be because of this issue. I see him, Gov. Holcomb, as being the only candidate in the 2020 election that is against cannabis reform." And, there's been a slight shift in what advocates want from the movement. Though it has been mentioned before, Phipps is now stressing decriminalization as a main drive in the fight. "I see just as much support growing for decriminalization, as well. We don't think people should be in prison for possessing something that's legal in a lot of other states," said Phipps, noting that he believes Illinois replaced a governor because of the issue. Phipps said veterans and senior citizens in every county are some of the Hoosiers that want medical cannabis as an alternative way to help with chronic pain. He said Holcomb's choice to ignore the issue may lead to support from many different directions, of another candidate.